Jamie thought he’d gotten free of software, of business, of wheeling and dealing. But life has a way of dragging you back into what you don’t want. With his new love, Nica, by his side, Jamie has turned in his Sales Guy Hat and taken on running the best coffee shop in a small Italian town. But that doesn’t mean he understands life any better. 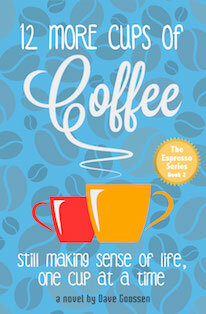 ’12 More Cups of Coffee’ continues Jamie’s adventures in life, love and the pursuit of a really good cup of coffee. Old friends (or are they enemies?) return, and Jamie finds himself racing across the world to put things right again before it’s too late for him and for what he really wants in life. But only once he figures out exactly what that is.